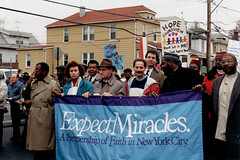 Interfaith Partners of South Carolina is one of hundreds of initiatives that seek to foster engagement across lines of religious difference, efforts that are often collectively called the “interfaith movement.” A movement is not an organization: it has no single center, but is constituted by a common energy and commitment to improve relations between people of different religions. As the soil of society changes, a multitude of new interfaith groups have sprung up. Some interfaith groups focus on learning and understanding through dialogue; others address common social concerns; still others revolve around campus environments, or public spaces such as hospitals or prisons. Amid these different approaches, the movement represents a new cultural consensus: that better relations can be intentionally cultivated to shape a better society. 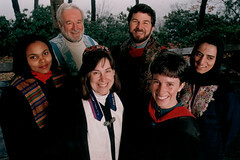 Interfaith councils were a significant new development in American society in the late twentieth century, and they continue to diversify in the present day. Councils of churches, churches and synagogues, and clergy associations have had to face the question of whether to extend the roundtable to include representatives of other religious traditions. This happened in Wichita, for example, when Inter-Faith Ministries, founded by Christian ministers in the 1880s, came to include Jewish, Bahá’í, Muslim, Hindu, and Buddhist members. Syracuse’s Interfaith Works of Central New York began in 1975 when the Metropolitan Church Board decided the community needed a council to represent all faith traditions, not just Christians. Today, Interfaith Works supports refugee resettlement, a food bank, projects serving people experiencing homeless, companionship programs for the elderly, and an annual city-wide rubber duck race that serves as a fundraiser for anti-racism efforts. Interfaith groups often are born from the practical necessity of addressing serious community issues. A Partnership of Faith in New York City began in 1990 when clergy from several religious traditions met to make a united response to rising levels of urban violence. Today, their “trialogues” bring Jews, Christians, and Muslims together to “unite their voices on behalf of justice, peace, and healing in New York City.” In Salt Lake City, Utah Interfaith Power & Light—a chapter of a broader national organization, Interfaith Power and Light—brings together different religious and philosophical communities around the issue of climate change and environmental justice, offering energy audits for local worship communities and green congregational partnership programs. In Atlanta, graffiti, violence, and zoning laws against Jewish and Hindu temple construction projects defined the direction of the Gwinnett Interfaith Coalition, which proceeded to help establish a county-wide human rights task force. Today, the Coalition has become a chapter of the Georgia Interfaith Alliance, a member organization of the Washington D.C.-based advocacy organization, The Interfaith Alliance. One of the oldest interfaith groups is the Interreligious Council of Southern California in Los Angeles, founded in 1969 as a Catholic, Jewish, and Protestant organization. Today the Council includes Bahá’í, Buddhist, Greek Orthodox, Muslim, Sikh, and Hindu representatives. 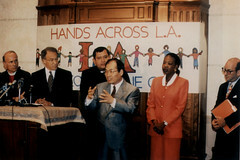 In the wake of the L.A. riots in 1992, the Interreligious Council organized a massive “Hands Across L.A.” event in which citizens of every faith came out to demonstrate their commitment to working together by forming a human chain many miles long across the heart of Los Angeles. Over the years, the Council has supported the appointment of a Buddhist chaplain in the State Senate and has also backed the Sikhs in their petition to the L.A. Police Department to be allowed to serve as policemen while wearing the required beard and turban. When the Hsi Lai Buddhist temple in Hacienda Heights was stalled in five years of zoning battles, the Council came to the aid of the Chinese Buddhist community; they demonstrated similar support for the Vedanta Society, the Muslim community, and the Thai Buddhist community engaged in similar zoning battles. As founder and Roman Catholic Monsignor Royale M. Vadakin insists, the Council’s strength lies in its web of relationships. “You cannot institutionalize trust and friendship,” he said. Colleges and universities have emerged as sites of innovative approaches to engagement and to chaplaincy. Many American public and private colleges and universities are changing chaplaincy, religious life, and/or student affairs structures to reflect the growing religious diversity on campus. Liberal arts colleges established a century or more ago and linked to Christian denominations have, in many cases, led the way. 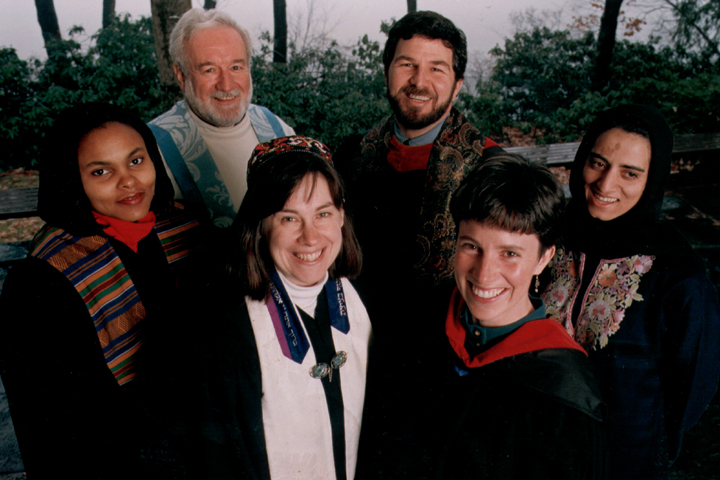 The Wellesley College Multi-Faith Chaplaincy is one of the first to wholly alter its conception of college religious life. No longer is Christianity at the center of the wheel with subsidiary chaplaincies to minorities, but the whole conception has become multireligious, as have all official Wellesley College events. Patterns of chaplaincy have become more complex in hospitals and correctional systems as well, as chaplaincy staff—like the patients, families, and medical professionals they serve—have become increasingly diverse. More “chapels,” like the one at the Children’s Hospital in Boston have been redesigned to provide space for Muslim prayers or for meditation, and often contain the scriptural texts of many traditions. In prisons, too, there are new forms of chaplaincy, including Buddhist chaplains and meditation programs. The New York State prison has more than thirty Muslim chaplains and a vigorous program of Islamic study. Across the country, Marin County, California, has an Interfaith Jail Chaplaincy sponsored by the Buddhist, Christian, Jewish, and Muslim communities. Similarly, in the wake of the Park51 controversy in 2010 and related violence against Muslims nationally, the Minnesota Council of Churches partnered with 27 religious and nonprofit groups to sponsor a massive interfaith service in Minneapolis, “Minnesotans Standing Together.” Over a thousand Minnesotans attended the service which was also broadcasted on local news channels. In these instances in Washington D.C. and Minneapolis, communities were able to build upon existing relationships to respond to the urgency created by current events. Within the common work of building relationships, each organization also has a distinctive style and practice. In Central Ohio, the Interfaith Association organizes house meetings in which five to seven people of different religions meet in one another’s homes to talk about their faith. The Grand Rapids Interfaith Dialogue Association in Michigan also emphasizes this small group dialogue experience and has expanded its efforts to sponsor an annual educational conference. The DuPage Interfaith Resource Network addresses the many educational and community-building needs of the western suburbs of Chicago. One Jewish participant described the suburbs as “the interfaith frontier,” where the next big developments in America’s interreligious relations will take place. The Interfaith Community Institute in Atlanta, Georgia offers intensive trainings and workshops for leaders of religious communities. In Cleveland, Building Bridges connects local religious and social justice communities through community murals and arts projects. The Tri-Faith Initiative in Omaha, Nebraska is in the process of planning and building a campus that will include a Christian church, a Jewish synagogue, and Muslim mosque, as well as a center for interfaith and community events. A case study about the initiative, “An Invitation to a Tri-Faith Neighborhood,” was completed by the Pluralism Project in 2011 and is available online. The case study of the Tri-Faith Initiative was completed as part of a Pluralism Project pilot study, America’s Interfaith Infrastructure: An Emerging Landscape, funded by the Arthur Vining Davis Foundations. In addition to reaching hundreds of interfaith organizations by survey, the study evaluated promising practices, profiled leaders, and highlighted case studies from interfaith initiatives in twenty U.S. cities. According to survey responses from interfaith organizers across the nation, “relationship-building,” “education,” and “dialogue” are the three most common purposes they felt spoke to the central mission of their organization. Time and again, the friendships forged from these efforts seem to create vital channels for communication that prove invaluable in times of controversy. In Jacksonville, Florida, for example, a local interfaith group, OneJax, found itself relying on its strong network when a divisive and inflammatory public debate erupted over the appointment of Dr. Parvez Ahmed, a local Muslim resident and former member of CAIR, to a position on Jacksonville’s Human Rights Commission. Together, OneJax and its allies played a critical role by organizing efforts behind the scenes, publicly sharing their voice in meetings and through formal statements, and as individuals by sending letters to city council and the media. Every public institution in America today faces the challenges of pluralism, and developing an interfaith infrastructure for increasingly multi-religious cities and suburbs is increasingly becoming a priority on the American agenda. Due to the complex reality of America’s religious life, hundreds of new expressions of interfaith activity are all part of a growing, nationwide experiment in broadening pluralism. Together, they indicate a growing and vibrant interfaith infrastructure. In 2011, President Barack Obama announced the President’s Interfaith and Community Service Campus Challenge, an initiative intended to advance “interfaith service” on college and university campuses nationwide. Since his inauguration, President Obama has emphasized interfaith cooperation and community service – “interfaith service” for short – as an important way to build understanding between different communities and contribute to the common good. American colleges, community colleges, and universities have often been at the forefront of solving our nation’s greatest challenges. In response to the first year of the President’s Interfaith and Community Service Campus Challenge, this year over 250 institutions of higher education are making the vision for interfaith cooperation and community service a reality on campuses across the country. The White House invites all institutions of higher education to join this powerful movement for the coming year. This initiative is led by the White House and is supported by the Department of Education and the Corporation for National and Community Service (CNCS). 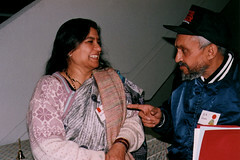 South Carolina Governor Nikki Haley declares January 2013 “South Carolina Interfaith Harmony Month.” Haley, a Republican, was elected in 2010 and is the state’s first Indian American governor. Governor Haley’s declaration was part of a series of events organized by Interfaith Partners of South Carolina to honor South Carolina Interfaith Harmony Month. A lot of what I think people in this country know is that we are blessed in this country because we have so many faiths that come together, we have so many nationalities that come together. That is what makes America the best country in the world. And the fact that we celebrate that. We celebrate it but we don’t always talk about it. And because we don’t always talk about it, it leaves people somewhat limited. And so what I appreaciate all of you doing is starting to talk about it. What I ask that you do more of it. We need more education. People are fearful of what they don’t know. And what I know is that when my parents raised me they said everyone has their own path and our job is to respect that path. And so that is what I have always done. I think South Carolina has made huge strides. I mean, the fact that they elected an Indian American female says a lot [chuckles]. The fact that we just appointed an African American United States senator says a lot. But on the topic of religion or faith, that has not necessarily been talked about. It came up a little bit with Kennedy and that was kind of brushing the waters and then it came up big with Mitt Romney. I think it’s only goingto be talked about more. But it has to be talked about the way we talk about race which is, or nationalities, which is this is bringing more to the table, than trying to take anything away from anybody.